Introduction: Hangal is a town in Haveri district in Karnataka. It is situated at the bank of Dharma river. It is referred as Panungal, Hanungal, Viratkote, Panthipura, Viratapura and Viratanagara in inscriptions. Population of the town in 1872 was 4990, which increased to 5272 in 1881. As of 2001 India census, Hangal had a population of 25,011. As per inscriptions, Hangal was the capital town of division Panungal-500 which was part of Banavasi-12000. Reference of Viratapura led to the tradition of believing it to be Viratnagar of the ancient times. A remarkable conical mound locally known as Kuntina Dibba or Kunti’s hillock connects the town with the Mahabharata heroes. It is believed that Hangal is the ancient Viratnagar where Pandavas spent their time in exile. Kuntina Dibba is believed to have formed of the husks of the grain ground for her sons. In 1830, Sir Walter Elliot ran a trench nearly into the center of the mound, but it appeared to consists entirely of earth. In present context, the ancient Viratnagar is identified with modern Bairat near Jaipur. It was ruled by the Kadambas of Hangal and Banavasi as the feudatories under the Western Chalukyas. About the beginning of the thirteenth century CE, Hangal was conquered by the Hoysala king Ballala. A hero-stone found in Tarakeshvar temple mentioned death of a hero who tried to repulse the Hoysala king. Inscriptions: Twenty inscriptions found in the town were published in Annual Reports on Indian Epigraphy for 1946-47. A slab in the compound of Adder Savamtrevva in Hale-kote – Annual Reports on Indian Epigraphy for 1945-46, no 224 – date lost – Damaged. Seems to record some gifts of land to Tribhuvana-sakti-pandita, (disciple of) Goravesvara-pandita for the worship, etc., of the god Bikkesvara of Pantipura. A slab on the well in the field of Desai in Hale-kote – Annual Reports on Indian Epigraphy for 1945-46, no 225 – Western Chalukya Tribhuvanamalladeva – Chalukya Vikrama year 44, corresponding 1119 CE – Registers certain gifts of land for the offerings, repairs, etc., of the temple of Bilesvara of Pantipura made to Devarasi-pandita, when Mahamandalesvara Tailapa was governing Panungal-500 and Banavase-12,000. Slab outside the temple of Hanuman – Annual Reports on Indian Epigraphy for 1945-46, no 226 – Chalukya Vikrama year 45, corresponding 1120 CE – Records gifts of land made by the 4 gavudnas of [Perijur] situated in Edevolal-70, a kampana of Hanungal- 500. The grant was made to the temple of Somesvaradeva constructed at Gadiyankamallana-bidu. Mentions that Tailapa was governing Banavase-12,000 and Hanungal-500. Hero-stone outside the temple of Tarakesvara – Annual Reports on Indian Epigraphy for 1945-46, no 241 – Western Chalukya Tribhuvanamalladeva – Chalukya Vikrama year , corresponding 1122 CE – Registers certain gifts of land to the temple of god Tailesvara- deva, while Tailapa of the Kadadba family was governing Banavase-12,000, Panungal-500 and Santalige-1,000. Tailapa’s genealogy is given. A wall inside the ardha-mandapa of the Tarakesvara temple – Annual Reports on Indian Epigraphy for 1945-46, no 227 – Kadamba (Hangal) Vira-Soyideva – Regnal year 5, corresponding 1180 CE – States that Bomma-gavunda obtained the gavudike of Sembo¬lal by the favour of Amaresvaradeva in the presence of prominent persons and guilds. Slab on the bank, near the washing place, of the Dharma river – Annual Reports on Indian Epigraphy for 1945-46, no 228 – Kalachuri Bijjala – Damaged. Seems to states that Mahapradhana-dandanayaka Dakarasa and others revived a former grant. Hero-stone set up, near the Isvara-katte in the Kumbhara street – Annual Reports on Indian Epigraphy for 1945-46, no 229 – Damaged. Seems to record the death of a hero named Kavadeva. Hero-stone on the bund of the Anikere tank – Annual Reports on Indian Epigraphy for 1945-46, no 236 – Kadamba Tailapa – Damaged and illegible. Hero-stone on the bund of the Anikere tank – Annual Reports on Indian Epigraphy for 1945-46, no 237 – Kadamba Tailapa – date lost – Damaged. Refers to the death of Santayadeva, son of Mavulideva. Hero-stone outside the temple of Tarakesvara – Annual Reports on Indian Epigraphy for 1945-46, no 238 – Kadamba Kamadeva (1181-1203 CE) – Damaged. Seems to record the death of a hero (name lost) who fought on behalf of his lord Kamadeva. Hero-stone outside the temple of Tarakesvara – Annual Reports on Indian Epigraphy for 1945-46, no 242 – Kadamba (Hangal) Kamadeva – Regnal year 15, corresponding 1196 CE – Records the death of a Sahani in a fighting when Hoysala Ballaladeva had attacked Hanungal. He is stated to have had his camp at Avaregere. Hero-stone in front of the Mailaradeva temple – Annual Reports on Indian Epigraphy for 1945-46, no 234 – Kadamba (Hangal) Mallideva – Regnal year 15, corresponding 1196 CE – Damaged. Records the death of a hero (name lost). Below an image of Nara-yana outside the temple of Siddharame-svara – Annual Reports on Indian Epigraphy for 1945-46, no 230 – dated Saka 1310, corresponding 1387 CE – States that Chandoja made the huvanige of the image of god Madhavadeva. Slab set up in the field of Tippanna Kamati – Annual Reports on Indian Epigraphy for 1945-46, no 231- Refers to the boundary of the street of Tamil (Tigula) merchants. Mentions Nandana Pille. In characters of the 15-16th century CE. Hero-stone on the bank of the tank near the District Local Board Office – Annual Reports on Indian Epigraphy for 1945-46, no 232 – Damaged. Seems to mention A[ra]deva. Hero-stone in the field of Chandiki-Bharamappa – Annual Reports on Indian Epigraphy for 1945-46, no 233 – Damaged and illegible. Hero-stone in front of the Mailaradeva temple – Annual Reports on Indian Epigraphy for 1945-46, no 235 – Badly damaged. Hero-stone outside the temple of Tarakesvara – Annual Reports on Indian Epigraphy for 1945-46, no 239 – Damaged and illegible. Hero-stone outside the temple of Tarakesvara – Annual Reports on Indian Epigraphy for 1945-46, no 240 – Damaged. Seems to record the death of Basava-Nayaka in the battle. His bravery is praised. Slab lying near the temple of Siddharamesvara (Hale-Kote) – Annual Reports on Indian Epigraphy for 1945-46, no 243 – written in Persian, indistinct. Monuments – Bombay Gazetteer reports thirteen temples and a ruined fort at Hangal. 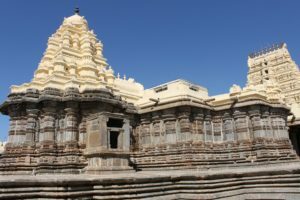 These temples are three of Hanuman, one each of Durga, Gopalrao Desai (name of the builder), Ishvar (Shiva), Narayan, Ramlinga, Tarakeshvar, Virabhadra and Virupaksha. Tarakeshvar temple is the most interesting in terms of antiquity and architecture. Tarakeshvar Temple – The temple faces east and consists of a Nandi-mandapa supported on twelve pillars, sabha-mandapa supported on forty pillars, antarala supported on four pillars and a garbha-grha. Stone benches with slanting rest-stones run all around the sabha-mandapa. On these benches are placed half-pillars supporting the roof. Garbha-grha houses a shiva-linga. The central ceiling of the sabhamandapa is carved in a beautiful hanging lotus bud. This dome, measuring 21 feet in diameter, is supported on eight sculpted pillars placed at the corners of an octagon. Eight smaller pillars are placed in pairs between these on each side of octagon to provide further support. On the capitals of these pillars are stationed ashta-dikpalas in bold relief. The dome rises about 9 feet from the octagon in five ascending tiers of circles of cusped moldings and it descends towards the center in form of a star shaped central pendant. This pendant hangs about five feet below the highest point of the ceiling. Though mentioned as the work on a single stone, this dome is in fact constructed with many stones in the usual way of diminishing circles. The roof of sabha-mandapa is supported on fifty-two pillars. It is joined to front with the Nandi pavilion supported on twelve pillars. On the parapet wall of the Nandi-mandapa and sabha-mandapa are depicted stray scenes from Krishna-lila and Ramayana. Some interesting scenes are setu-bandha (building of bridge over the ocean by the monkeys), Marich-vadha (slaying of golden deer by Rama), various demons slain by Krishna etc. Few hero-stones are placed inside sabha-mandapa. Two of these display fighting scene inside and outside a fort. This would be the fight between the Chalukyas and Hoysalas when the Hoysala king Ballala attacked the fort. Two broken dvarpalas, one broken Mahishasura-mardini images are also placed in the sabha-mandapa. A loose sapta-matrika panel is placed outside the temple entrance. The sapta-matrika and Mahishasura-mardini panels might have been adorned in the niches inside the antarala as found common in many Kalyana Chalukya temples. Few sabha-mandapa pillars require special mention here. On the capital of these pillars are found various animals, like elephant, vyala, lions etc. These pillars are exquisite piece of art and style. The antarala doorway is elaborately carved. It has lintel decoration in form of a makara-torana adorning Ganesh, Brahma, Shiva, Vishnu and Kartikeya. It has six door jamb sections adorned with various decoration schemes. Above the lintel are seven miniature shrines. Ganesh Temple – This temple is situated adjacent to the Tarakeshvara temple on its north. An image of Ganesh is placed over a high lotus pedestal. This curious temple has been constructed in Nagara Shekhari style which is not very common in southern India. Jain Temple – This Jain temple is located inside the fort complex. This is built on a stellate platform. It comprises of a mandapa, antarala and a garbha-grha. The superstructure is a recent renovation as the original dome fell down. At present, it houses a shiva-linga in its sanctum. Fort – The ruined fort is about 1900 feet round consisting of sixteen bastions as mentioned in Bombay Gazetteer. It further tells that the walls are on all sides easy of escalade and the dry bottom in front hardly looks like a ditch. The old wall of the fort is called as Hale-kote. The citadel is situated on the left bank of the Varada river. The south-east corner of the citadel rests on the Anikeri pond, after which the single outer wall is developed on the eastern face into three lines of defense, which, sweeping round the north side, join the works on the river, where it diverges to the west. Thus there are five lines of defense. The diameter of the fort wall is about seven or eight hundred yards and of the central tower about 350 yards. The circuit of the old fortified area is upward of four and a half mile and the earthwork is on an unusually large scale. How to Reach – Hangal is well connected with other major towns. It is 38 km from Haveri, 95 km from Harihar, 130 km from Gadag and 95 km from Dharwad. Haveri is the nearest major rail-head. Elliot, Walter (). On Some Remarks on Antiquity of Hanagal, in the Dharwad Collectorate, Southern Maratha Country published in Indian Antiquary vol V.